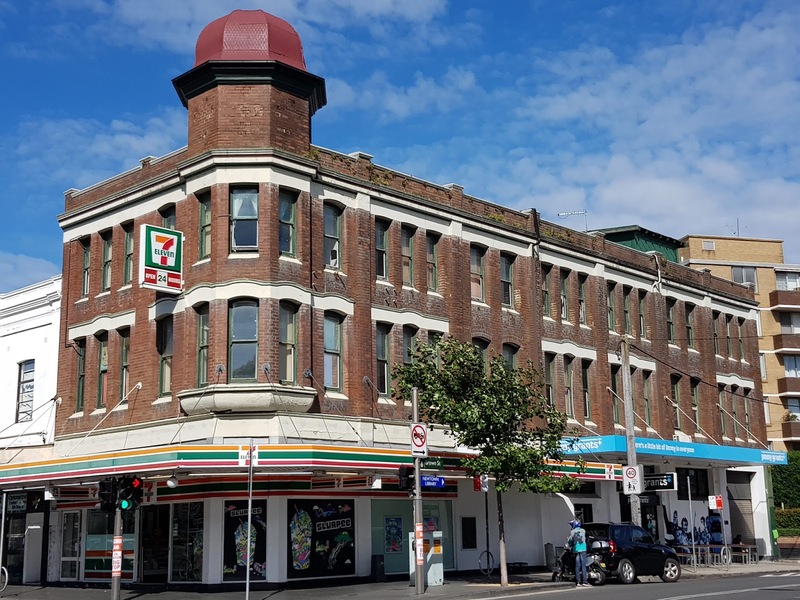 This heritage listed building with an octagonal, domed tower is located on the corner of King Street and Brown Street, in the inner city suburb of Newtown. The three-storey commercial and office building was built in 1909 in the Federation architectural style. It originally housed a bootmaker and an undertaker with a florist. It became a furniture warehouse in 1925 and later a college and restaurant. It now houses a convenience store and a Greek take-away shop. A distinctive looking building. 7-11 has become quite rare here. Most of their locations seem to have switched over to another store brand. The same thing has started happening here too. The city has more other brands and the suburbs are now catching up. One has to love these old style buildings! I wonder what the tower contained. Interesting history and I like the architecture! Great old building. The 7 Eleven sign made me laugh. In the US they are all free standing gas stations.